Sunday was one of those days in Charlotte where you just want to sit outside and sip a nice cold fruity drink. I dropped several hints of this to Brad as we made the two mile walk back from our new/old house. Finally, he got the hint and suggested we make it ourself, instead of going out to a restaurant or bar. Making adult beverages isn’t something I usually do, but I really liked his idea. Much cheaper! And much more fun! 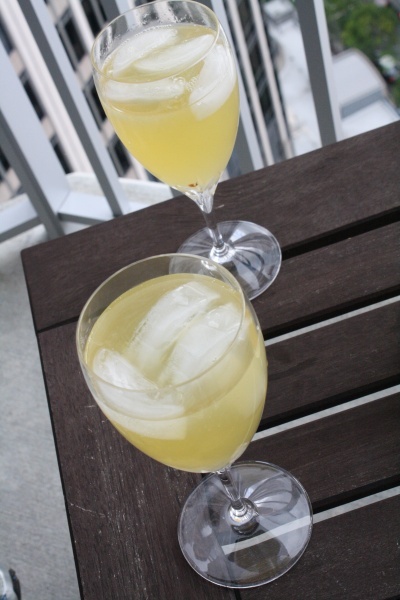 After discussing what to make for…oh, about 30 seconds…we decided on white sangria. What could be more perfect for warm sunny weather? Chill wine and pour into a pitcher. Chill seltzer and add it to the wine. 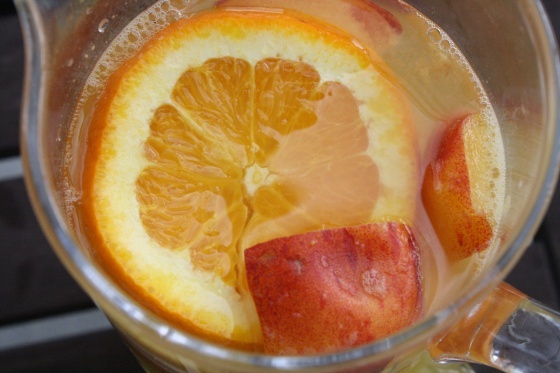 Squeeze the juice of 1 1/2 oranges and 1 lemon into the pitcher. Add the sugar and stir well. 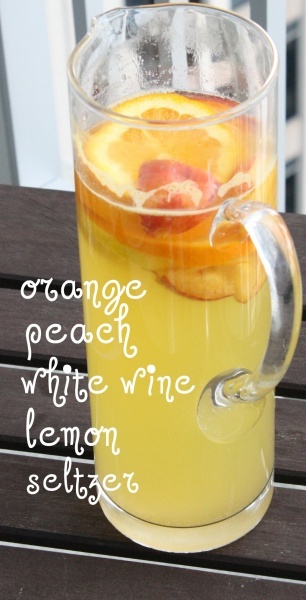 Slice the remaining 1/2 orange, 1/2 lemon, and peach and submerge in the pitcher. I thought this sangria was just sweet enough, but not overly so. 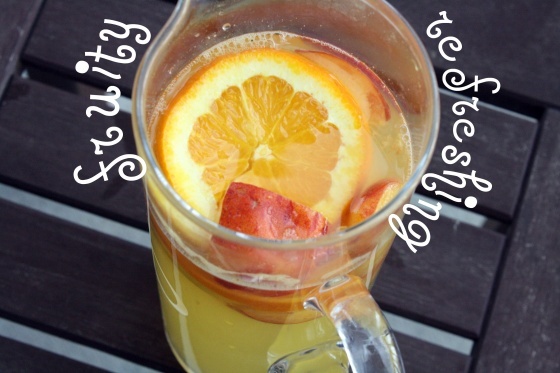 I loved the balance of the white wine, the fruit, and the bubbles from the seltzer — so refreshing. It would have been even better if it could sit for a few hours (maybe even overnight) to allow the fruit juices to really set in to the drink. But of course, we were way too impatient for that and decided to enjoy our white sangria out on the balcony, while the day was still warm and the sun was still high in the sky. Have you ever played bartender at home? What’s your favorite thing to drink on a hot almost-summer day?